A LOW avalanche danger remains in the mountains surrounding Turnagain Pass. Popping out an old wind slab sitting on faceted snow, breaking off a chunk of cornice or triggering a larger slab avalanche are all in the realm of 'unlikely possibilities'. Most suspect terrain will be steep slopes further away from the road corridor and periphery zones like the Girdwood Valley and Placer Valley. *Good travel habits should not be left at home during 'green light' conditions; expose one person at a time, watch your partners, have an escape route planned and group up in safe zones. Tomorrow night: Fireside Chat: Avalanche Awareness and Rescue with the CNFAIC in Girdwood at the Powder Hound Ski Shop! December 15 @ 6:30 pm - 8:00 pm. FREE! While we patiently wait for the next snow event, folks continue to get out and enjoy the blue sky days and what snow we do have. To generalize, the snowpack above treeline is anywhere from 3-6' thick on the North end of Turnagain Pass and 2-3' thick on the South end the Pass (more snow typically falls on the North end because it's closer to the Arm). Along the road the snowpack is anywhere form 6" to 20". It has been 14 days since our last snow event that added 6-10+". The snowpack is generally stable and turning to sugar snow from the top down (near surface faceting) and in many thinner areas like Summit Lake, from the bottom up (forming depth hoar). Essentially, these cold days are creating a very weak foundation for the next load of snow. If you are headed out today, watch for wind slabs near ridgelines that are sitting on weak faceted snow (we received a report describing a wind slab that collapsed but didn't release yesterday in the Girdwood Valley). Additionally, watch for cornices and 'facet' sluffs on very steep terrain. Last, the 'outlier' slab avalanche that could fail mid-pack due to the Nov 16 buried surface hoar is worth keeping in the back of your head. It looks as though yesterday closed up the last of the single digit temperatures and bluebird skies. 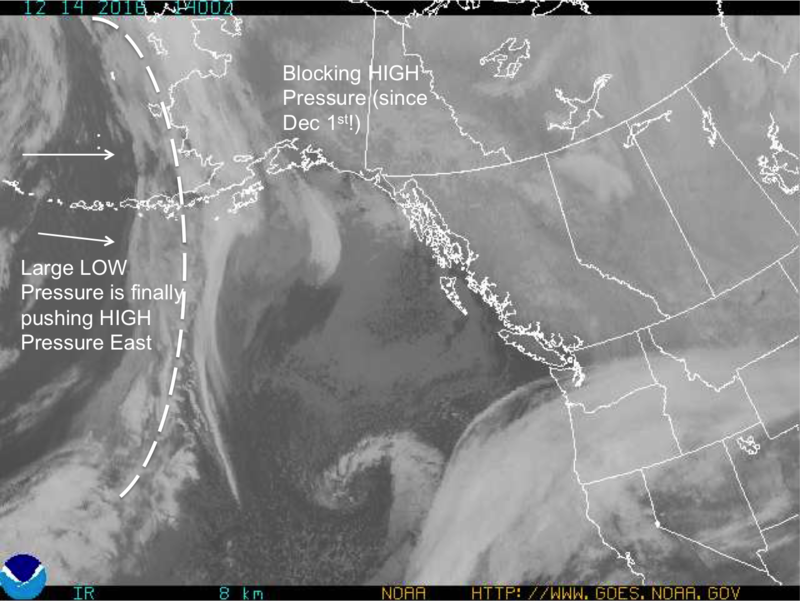 A large area of low pressure is pushing in and scouring out the cold air. Temperatures warmed up to the 15-25F range from valley bottoms to ridgetops overnight and ridgetop winds have remained light from a Westerly direction. For today we should see mostly clear skies with some valley fog. Temperatures will remain in the 15-20F range in the parking lots and mid 20'sF along the ridgelines. Winds are expected to be Northwesterly around 5-10mph on the ridgelines. Again, the more interesting news is this weekend and next week. If the stars align we should see snow accumulation as early as Thursday, and not only snow to sea level, but snow falling at Hatcher Pass. At his point, models are showing a Southwest flow direction for Thursday into Friday - favoring Hatcher Pass as well as Anchorage. The larger system for Sunday looks to favor Turnagain Pass. increased precipitation chances, especially along the coastlines. by early next week as well."